Then, just as the children finish singing and a quiet settles on the room, the bedroom windows swing open and Williams swoops into the scene, landing cat-like on the floor. NBC will try to defy a few Newtonian laws when its cameras capture “Peter Pan Live!” from these studios Thursday night. A follow-up to last year’s massively viewed, critically dissed “The Sound of Music Live!,” the network’s new live-theater go-round, in mostly British accents, seeks to replicate 2013’s populist success while upping the stakes. “Peter Pan Live!” is a far more elaborate production, with flashier set pieces and effects than the Von Trapp tale. It also features a bolder cast — in addition to Williams in the title role, Minnie Driver as the narrator and grown-up Wendy and theater performers Christian Borle, Taylor Louderman and Kelli O’Hara in supporting roles, Christopher Walken stars as Capt. Hook. It’s his first major network appearance in more than a decade. The idea behind the show, producers say, is to combine old and new. As a live TV event, the production is a throwback to another era, yet it aims to capitalize on the real-time immediacy of the social media age (and outmaneuver DVRs besides). As much as the piece’s message about the appeal and perils of eternal youth taps into a modern zeitgeist, NBC is tackling the show differently than other contemporary iterations. “Peter Pan Live!” has none of the postmodern twists of the recent Broadway hit “Peter and the Starcatcher” or the upcoming Hugh Jackman origin-tale film “Pan.” Instead, it looks to tell the story as it hasn’t been told in decades — straightforwardly. Since the 1954 stage version launched with Mary Martin, “Peter Pan” has had many runs, including on television. NBC aired what was essentially the original Broadway version in 1955, then mounted a new production and broadcast it in 1960; that latter edition was then polished and re-aired multiple times over the decades that followed. Various revivals have also popped up on Broadway, most famously with Sandy Duncan as Peter in 1979. In recent years, new film and stage versions began taking a flip-it-on-its-ear, “Wicked”-like approach to the material. “Peter Pan” has remained popular thanks to its compelling, slightly melancholy boy who never grew up. Peter (usually played by a female due to the lilting melodies) begins the show visiting the house of the Darling children, including big sis Wendy, and taking them all back to Neverland. There he and his Lost Boys do battle with Capt. Hook, the man who blames Peter for the loss of his hand and vows revenge on the eternal child. There is also much sidekick gusto from Borle, the “Sound of Music” and “Peter and the Starcatcher” veteran who does double duty here as Hook consigliere Smee and the Darling father. “This is just a little more elaborate than ‘Sound of Music,’” Borle says dryly of the scope of the production shortly after rehearsing a number in an entirely different section of the soundstage. Indeed, where last year’s telecast was a traditional three-wall affair with basic blocking and Carrie Underwood singing, “Peter Pan Live!” is a colorful, swinging spectacle with multiple giant sets, smoke machines, fake night skies and a purple-hued Neverland created by the Broadway set-designing stalwart Derek McLane. The show aims to be the ultimate cinema-stage hybrid, which can create challenges — McLane says he initially wanted even more vibrant colors for Neverland, but they overwhelmed when viewed on a screen. To handle the moving parts, the production has hired two directors, the Emmy-winning award-show veteran Glenn Weiss and the Tony-winning Broadway choreographer Rob Ashford. During rehearsals, Weiss stood behind the monitors like a conductor as he watched nearly a dozen simultaneous angles, calling out numbers the broadcast would switch to with split-second timing. Unlike a stage show — which plays out all the action at once and lets theatergoers decide where to train their eyes, even small misalignments in camera-cutting here means the viewer will be looking at the wrong thing. This has added up to some pretty large stakes. NBC on Thursday has one chance to make it right; a second take for a flubbed scene isn’t an option. And while “Peter Pan Live!’s’” budget is unknown, there’s a reason (besides the DVR-proofing) that the network has been seeking a reported $350,000-per-30-second spot — this is not a low-budget enterprise. The aerials, for instance, are being orchestrated by Flying by Foy, the Las Vegas company that inaugurated techniques on massive stage productions, such as “Peter Pan,” that run for years, not one night. “It’s a big bet and a big expenditure and hopefully a big payoff,” says Robert Greenblatt, chairman of NBC Entertainment. Greenblatt says the network would break even with numbers “significantly below” the average 18.5 million viewers who tuned in for “Sound of Music.” And there are intangible branding benefits to “Peter Pan Live!” no matter where the ratings end up, he adds, since the production complements the network’s big-ticket events such as the Olympics and the Golden Globes. “Sound of Music” was mostly panned and provided cultural blood sport for both professional critics and social-media live-snarkers. 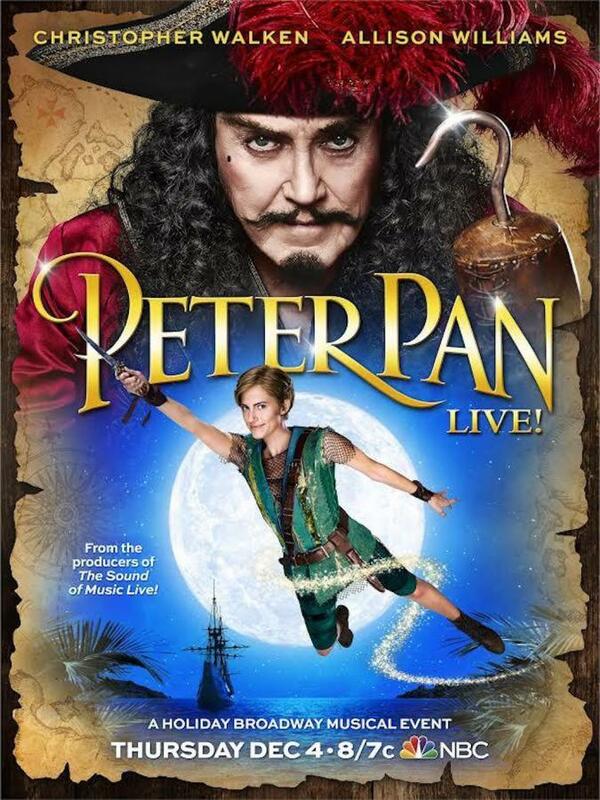 If the pattern is repeated, “Peter Pan Live!” could solidify a new commercial-entertainment genre: the massively popular, broadly derided event broadcast. As Greenblatt quips of last year’s telecast, “Everyone hated it but our audience.” And there’s money to be made with negative reactions too — rubberneckers, after all, count toward viewership figures too. Teasers for “Peter Pan Live!” have already engendered some Twitter titters. Chatting with the cast and crew, one finds them at the ready with some persuasive explanations: earnestness invites snark; it’s no fun for social media users to compliment live events so everything is skewed to the negative. Performing in a show like “Peter Pan Live!,” they say, simply means that these reactions come with the territory. Then she stands up, floats above the set and begins another song.